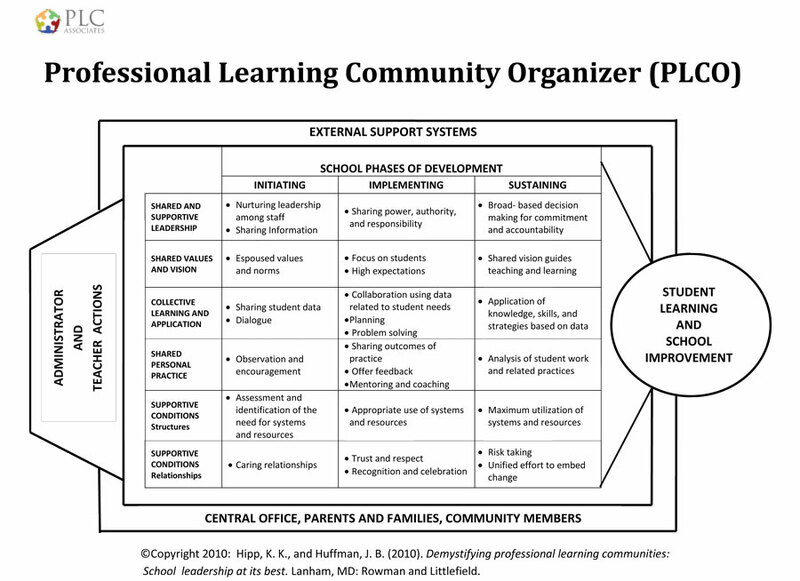 The Professional Learning Community Organizer (PLCO) provides a visual representation of the inputs (teachers and administrator actions), throughputs (five dimensions and phases of change), and outputs (student learning and school improvement). This visual describes actions for each phase of change as reported by Fullan (1990). In the initiating phase, leaders begin to connect a change initiative to student and school needs. In the implementing phase, leaders continue to focus on the change initiative, challenging the staff, as well as providing support. In the sustaining phase, leaders guide the staff so the change initiative becomes embedded in the school culture. This results in continuous learning for teachers and students. This visual also emphasizes the importance of external support systems including central office, parents, families, and community members to any substantive improvement initiative. Fullan, M. (1990). Staff development, innovation, and institutional development in B. Joyce (Ed.). Changing school culture through staff development (pp. 3-25). Alexandria, VA: Association of Supervision and Curriculum Development.